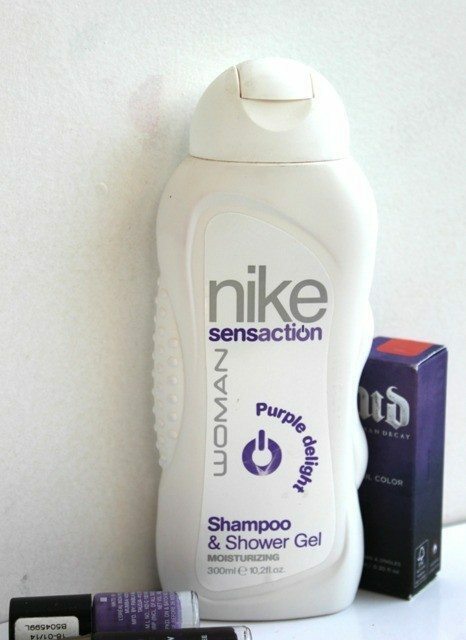 Nike Sensaction Purple Delight Shampoo and Shower Gel: is under the scanner today!I am an aroma junkie! I love trying out new bath and body products that smell great. Recently Nike launched its Sensaction Line of aroma shower gels and shampoos. I tried to check out the reviews, but couldn’t find any online. Since it was a new product and I was itching to buy a new body wash: P I promptly went ahead and purchased it in two variants-the Purple Delight and Coconut Passion. A body wash and shampoo two in one-suitable for women of all skin types. Apply on a loofah and lather well. This shower gel comes in a matte white bottle. It is easy to hold and compact. I will not call it travel friendly as, its flip open cap is fragile and prone to leakage. The shower gel is very runny. Be careful while taking it out, so that you do not squeeze out too much. It is creamy and lathers well. The fragrance is not lavender by any stretch of imagination. It is a berry like, chemichal smell which you expect from a product in the 1990s and not now. This shower gel is waaayyy behind its competition as far as fragrances are concerned. The scent was a disappointment. It does not last a second after the shower, so I really don’t know why this product is priced so high. Shower gels from other drugstore brands are almost half the price of this one and work much better. I disliked how my skin felt dried out after using it. Needless to say, I have not used it as a shampoo…no more experiments L All in all, I haven’t purchased a product that was such a huge failure-in a long time. Its more upsetting because, Nike is a very reputed brand. Well…anyways! Would I repurchase and recommend? No to repurchase…no to recommend. Please don’t waste your money on this one. Have you tried the other variants of this shower gel? Woah. Upon seeing the consistency and color of the shower gel,I thought this is a definite purchase. But thanks for saving our money..Great review..